Golf hasn't traditionally been the most cinematic of sports. One could probably count the number of golf movies on two hands, and none of them particularly memorable. Other critics’ opinion notwithstanding, I actually dug Robert Redford’s sappy “Legend of Bagger Vance” and there’s of course “Caddyshack”. 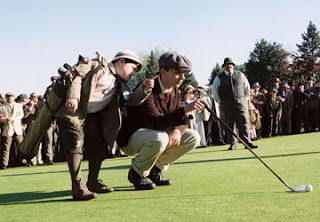 Disney grabbed onto this fun story from the 1913 US Open, which saw an unknown 20year old amateur battle the world’s best golfers and win, to make a decent golf flick without the usual Disney sport formula. Shia Lebeouf plays young Francis Ouimet, a Boston kid who grew up on the wrong side of the tracks. His boyhood idol was Harry Varden, the legendary British golf champion. When he gets a chance to meet Varden in person as a child, this informs his journey to become a champion golfer. His belligerent immigrant father who reeks of hard work, disapproves vehemently and refuses to acknoledge his son's talent. Despite this, Francis becomes a young star and actually qualifies for the US Open. In 1913 it's a special tournament which brings the two great British golfers, Varden (Stephen Dillane) and Ted Ray (Stephen Marcus) across the pond to compete against the reigning American US Open champion. While the film is structured around the journey of Ouimet to win the tournament with all that nail biting cinematic sports suspense, "The Greatest Game Ever Played" is a character film, and the parallel journeys of Ouimet, his hero Varden. Young Shia doesn’t need to hold down the whole film. We’re actually cheering for a number of characters to win. Though it’s a competitive sport golf is not head-to-head conflict but one of man vs. nature. And so it’s fitting writer Mark Frost’s real antagonists are off the course, the upper class twits who continually exploit and express their superiority over the working class golfers. The dramatic 18 hole playoff is between Varden, Ouimet and Ted Ray. Already the crass American champion has been defeated and it’s a battle between three heroes, all competing for their own personal glory. For Ray and Varden, victory is a vindication against a lifetime of working class discrimination and humiliation, and for Ouimet, his yearning for paternal acceptance. Stephen Dillane, a fine British actor, was never leading man material, but like most of his performances he shows a remarkable ability to internalize his emotions and in this picture, despite the success of his character, the British working class guilt is always etched in his face. If the name Mark Frost rings a bell, it’s the same Frost who co-created “Twin Peaks”. It’s a completely different ballpark he’s playing in here. Clearly it’s a personal story to him having adapted his own novel into a screenplay, then produced the movie himself and for the most part the final film retains its integrity. Bill Paxton, whose first film, “Frailty” was interesting though mostly flawed, takes the reigns as director. He employs as much visual gymnastics as possible to spitshine the look to maximum gloss. CG effects and macro close-ups give the film an energetic Michael Bay feel, a technique which unfortunately takes the audience out of it’s stuck-up mannered time period. As so, there-in lies the main problem. A mixture of period detail and new millennium techniques, dialogue and dramatization. Paxton tries to have his cake and eat it too. Every old world thought comes off as out of touch, and the triumph of class comes off as a no-brainer, when in reality Varden and Ouimet’s accomplishments were tremendously empowering. And so Paxton substitutes faithfulness to its time for flashy entertainment. And I can’t really complain about that, we must give Paxton, Frost and even Disney credit for retaining its roots in class and escaping the restrictiveness of period films. Enjoy.